I am so glad it is Friday. I want to forget this whole week, except for the birthday part. I took my 3 dogs for a walk when I got home and the little guy went after some ground squirrels with fierce determination. Cairn Terriers were bred to root out the vermin in the rocks of Scotland so these was some serious instincts kicking in. I saw 2 ground squirrels come out on the other side of the cactus and look around to see what horrible creature was disturbing their evening. My dog didn't even notice. He wanted to get in that hole. 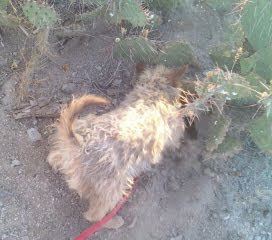 I eventually dragged him away since he was getting filthy and full of cactus needles. Then my sister called and said that the Pampered Chef pizza stone that I had given her had broken in half the first time they used it. What a bummer. I have been keeping that stone in my RV for the last 2 years waiting for the right opportunity to pass it on. It was brand new. She said it has a 3 year warranty but I was sure that I had thrown out the receipt. 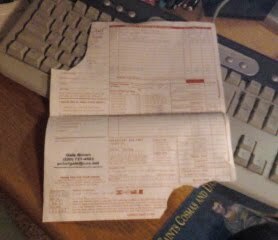 I had that receipt for 2 years and then, since I finally found a home for the pizza stone, I threw away the receipt. And I emptied my trash can yesterday. But just in case I was being extra environmentally friendly, I checked my recycle bag. I haven't taken my recyclables to the big bin in a while. What do you know? The receipt was in there but I had ripped off my name, address and credit card number. I looked up Pampered Chef online, not the official site but the other ones where people actually tell you real info, and people mentioned that they had to go through their representative for returns and replacements. My receipt had a contact email so I sent her a note. I don't expect to hear back from her but it is worth a try. It is very disappointing when I spend extra money on something that is supposed to be high quality and then it turns out to be junk. I'll let you know how it turns out. That looks like a determined little pup! Bummer on the pizza stone. Maybe it will work out in the end. I hope it gets replaced. I expect homeade pizza when I go to visit her next!